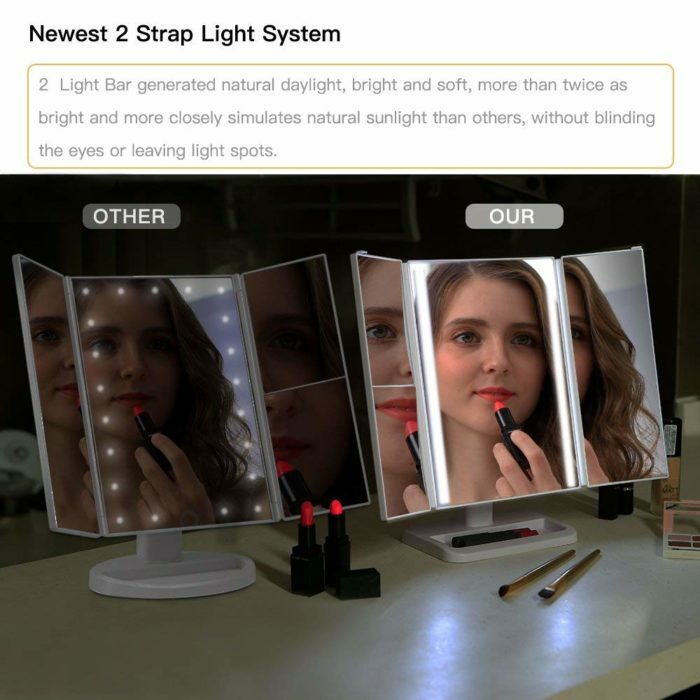 LIGHTED MAKEUP MIRROR WITH GLARE-FREE ILLUMINATION: The 24 natural LEDS are now installed within the two side light bars, instead of the visibly dazzling LEDs situated on the peripherals of the lighted makeup mirror. 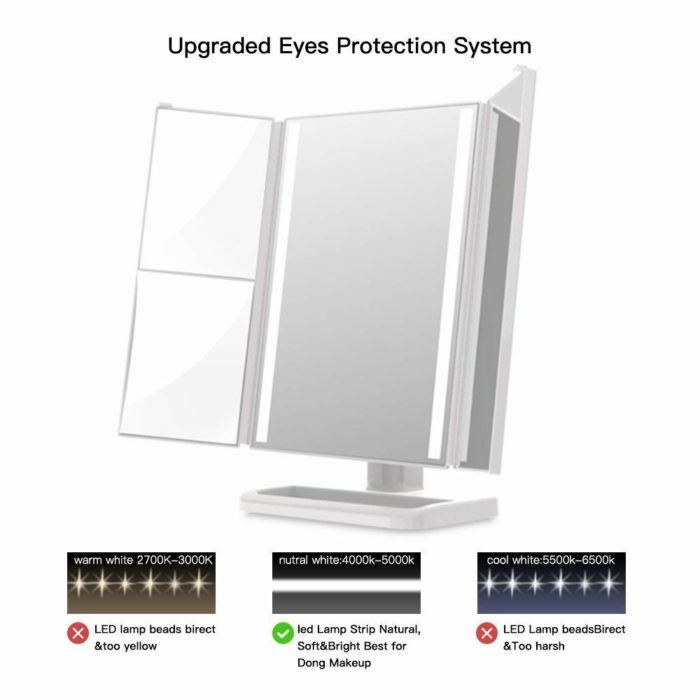 This provides you with a clear reflection without dazzling your eyes. 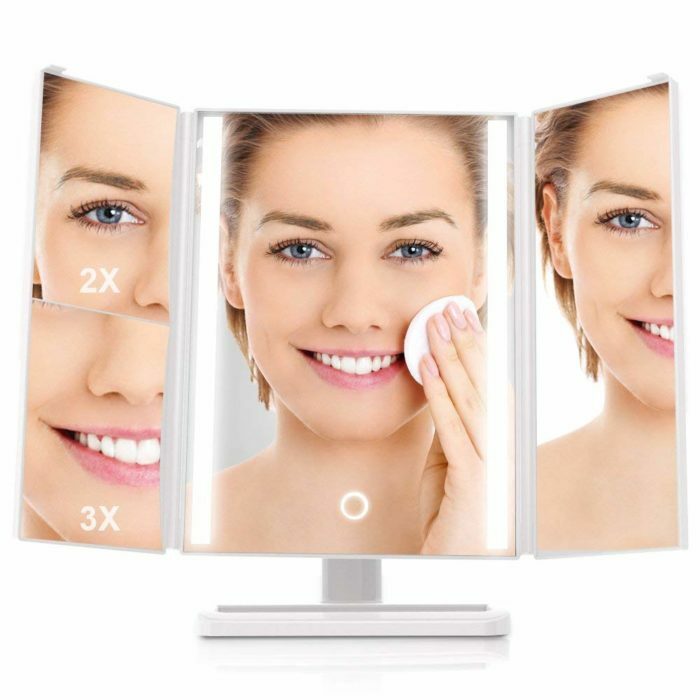 LARGE 14.8” *10” SIZE: Being larger in size than the other LED makeup mirrors, it not only affords you a bright and clear reflection but also allows you to visualize your face clearly. 3 MAGNIFICATIONS: The central and right regular mirror allows you see your overall makeup, great for applying foundation and the left side 2x & 3x magnified mirror allows you to see the tiniest beauty details, perfect makeup mirror for applying eyeliner, mascara, grooming brows and tweezing. TOUCH SENSOR: Just press the circle on the front of the lighted makeup mirror to adjust the brightness level to your desired level. 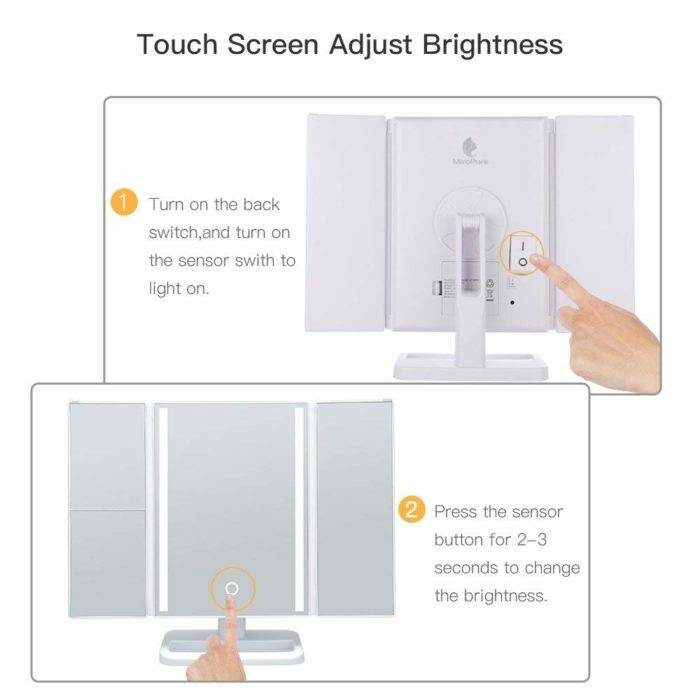 NOTE: Before touching the sensor button on the vanity mirror, please make sure the switch at the rear is in the ON position. 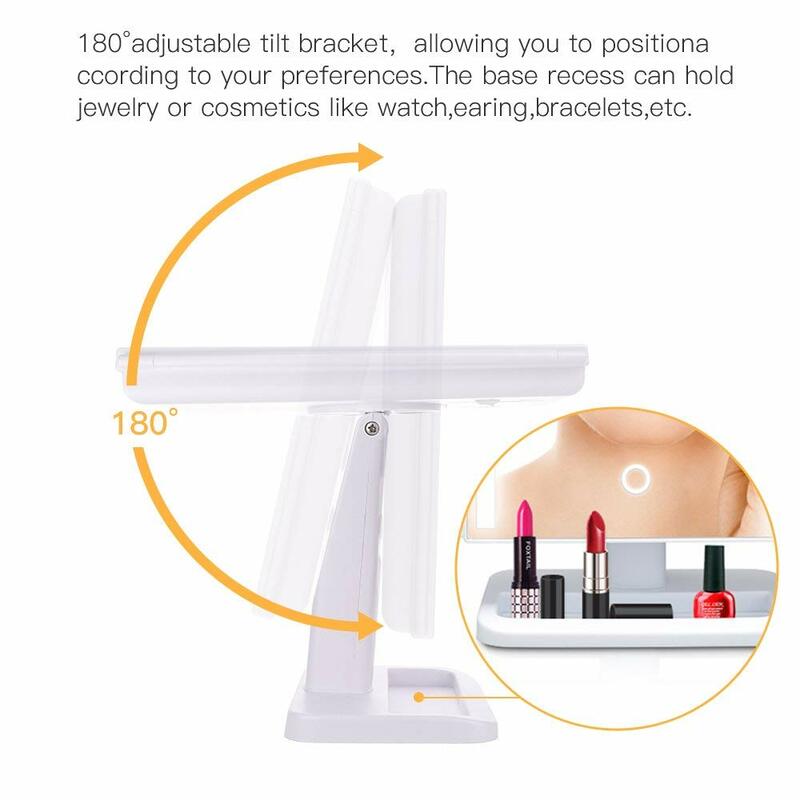 ADJUSTABLE VIEWING ANGLE: Perfect vanity makeup mirror with 180° up/down rotation allows you to view yourself from any viewing angle you want. The base allows for storage of jewelry and other items to keep your vanity table tidy. Question: Whay is the usb cable for if it takes batteries? 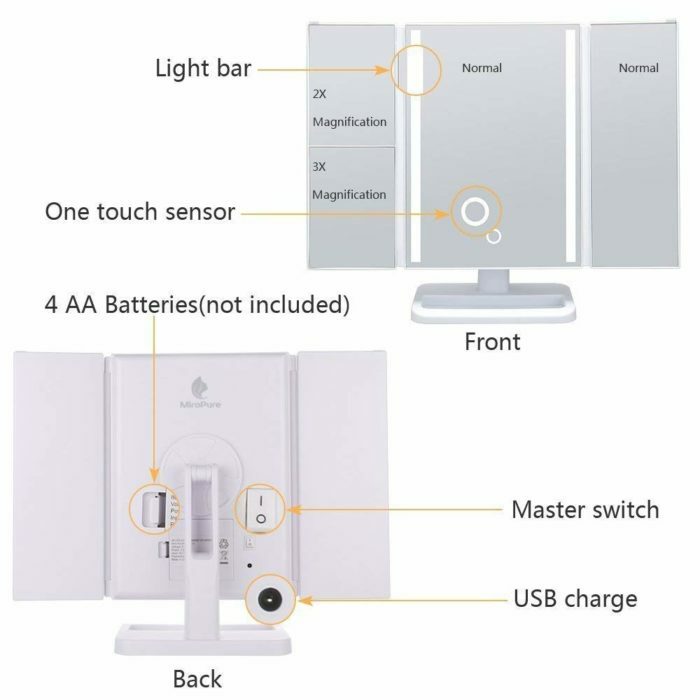 Answer: The mirror can be powered by 4 AA batteries or usb cable. when you use USB cable to power, you could connect the usb port into a power bank,PC or any USB wall charger. Question: What exactly does the USB “charge”? It doesn’t charge anything from what I can tell. It just powers the light when plugged in, right? 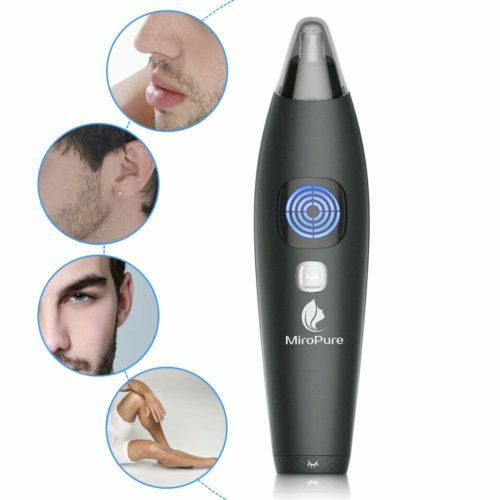 Answer: yes, the usb just power light for the mirror when plugged in. No charging function. Question: What are the dimensions of the middle/largest mirror? Question: Can anyone tell me what the warranty is on this mirror? Even the website doesn’t say. 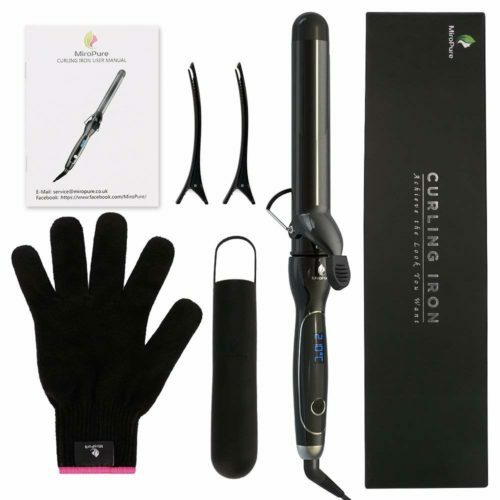 Answer: Please do not worry, there is one year warranty of the mirror, which means if your device have any problem within one year after you purchaed, you can directly contact to seller, and the customer service will be help you to solve all problems. Question: Then usb cord that came with the mirror is really short. do you know where i can get an extender, or a longer cord? Answer: You can find extenders at Walmart. If this has the mini end and the large end you can also find up to 10′ cords at Walmart. 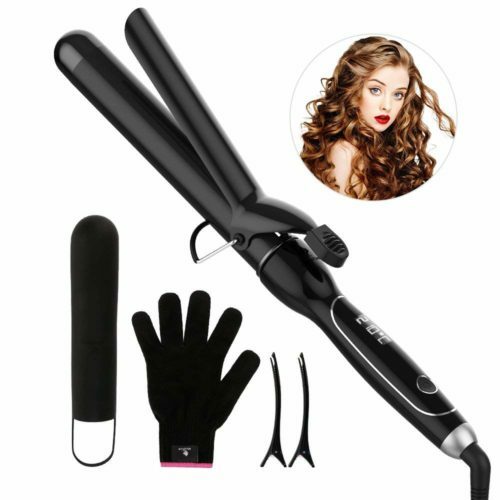 If one end has that round plug you may only be able to use an extension. Question: Does this have different lighting options such as cool and warm? Answer: It is a natural LED light, like daylight. So you can adjust the lightness but there is no color to choose. Question: I bought this for my granddaughter and got out of the box the make sure everything was included. I cannot figure out how to get the base to come off! Question: The material of mirror is glass? bought this for my teen . she loves it. Love my mirror. The light is too bright. I really don’t use the light, the mirror is great without it. This mirror is great. Clear with lighting. Battery or electric. 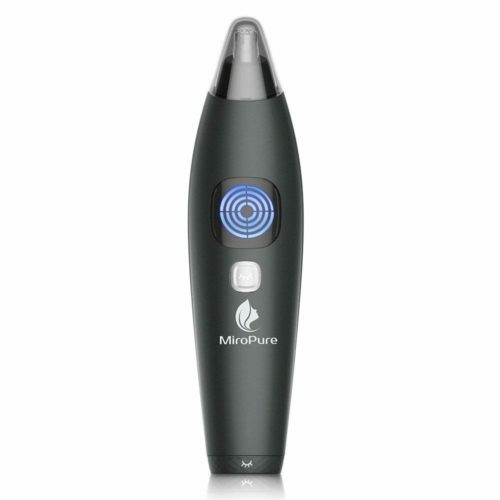 Works great and I love the light and magnification! I got this for a friend who is a makeup junkie. She loves it! Having 3 different mirror angles is a great advantage for those who like make up! 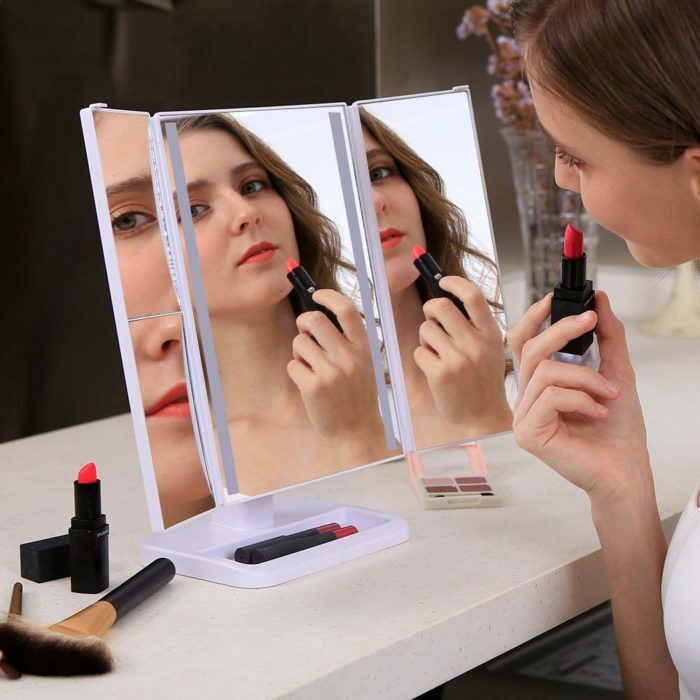 The best LED lighted makeup mirror! 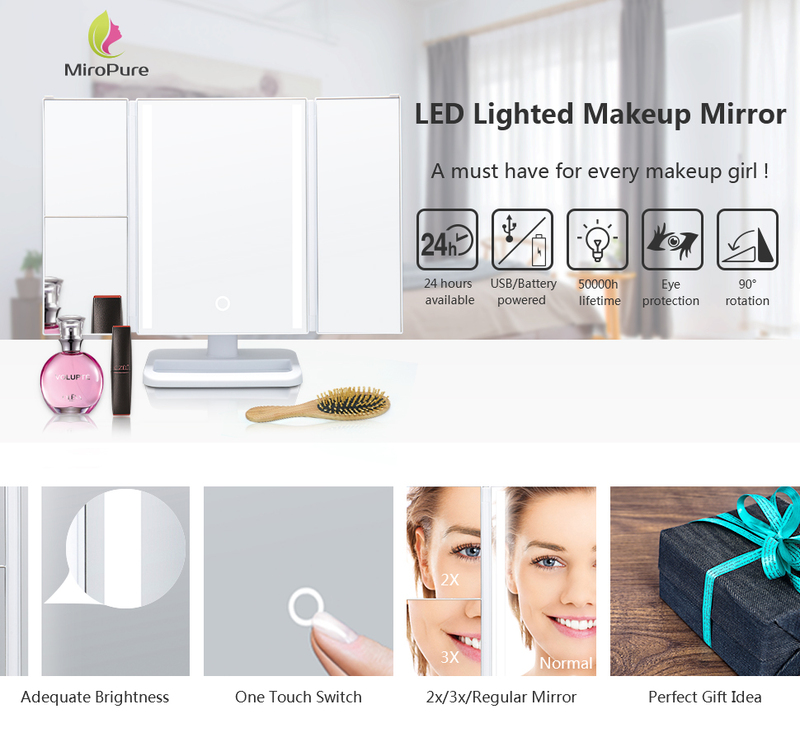 The best LED lighted makeup mirror and will recommend it. 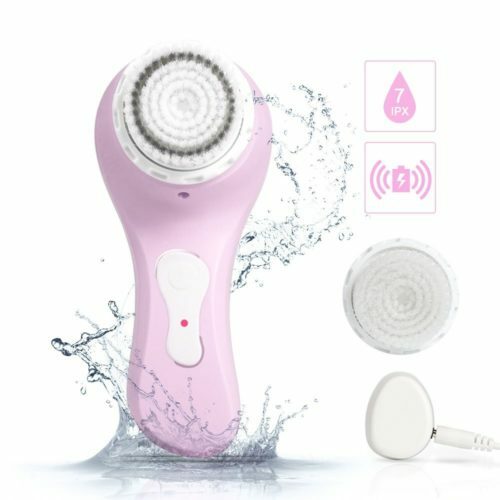 The LED light are really bright and very easy to use when you do your makeup. This is a nice mirror. 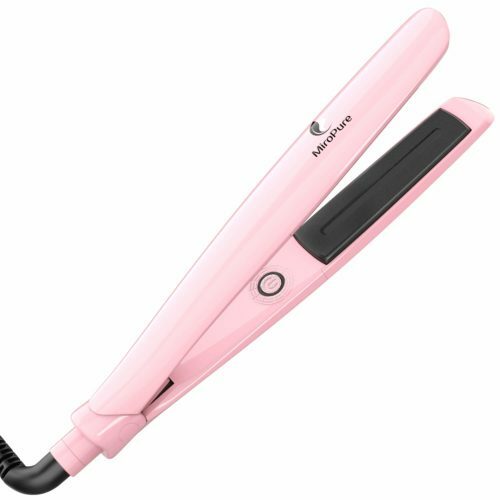 It looks sleek, modern, works well .. a little light, like sort of cheap feeling, not heavy duty, but my daughter uses it and loves it.! I love the mirror. I would given a 5 star but the mirror does not adjust up or down like suppose too. The light are a huge help especial since I’m in a darker room. Love love love this mirror!! Love love love this mirror!! It helps so much with my makeup tutorials! 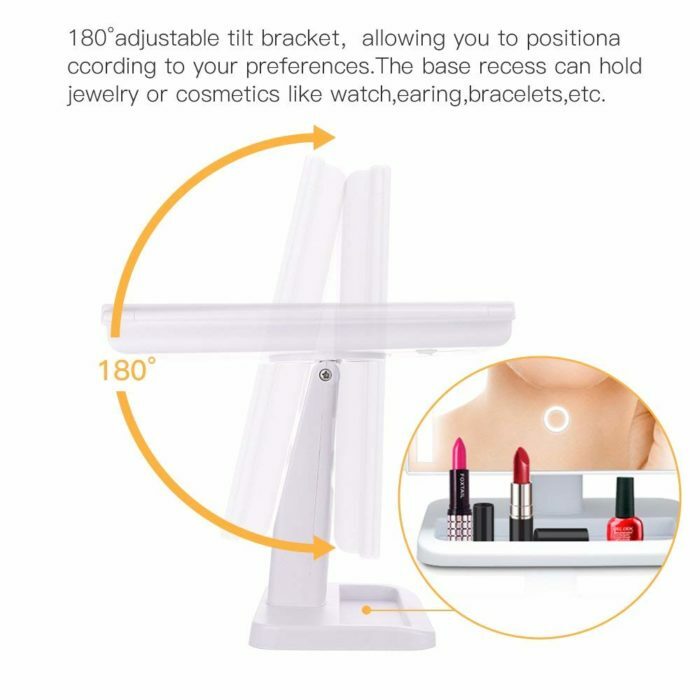 Works great and the light is easily adjusted. 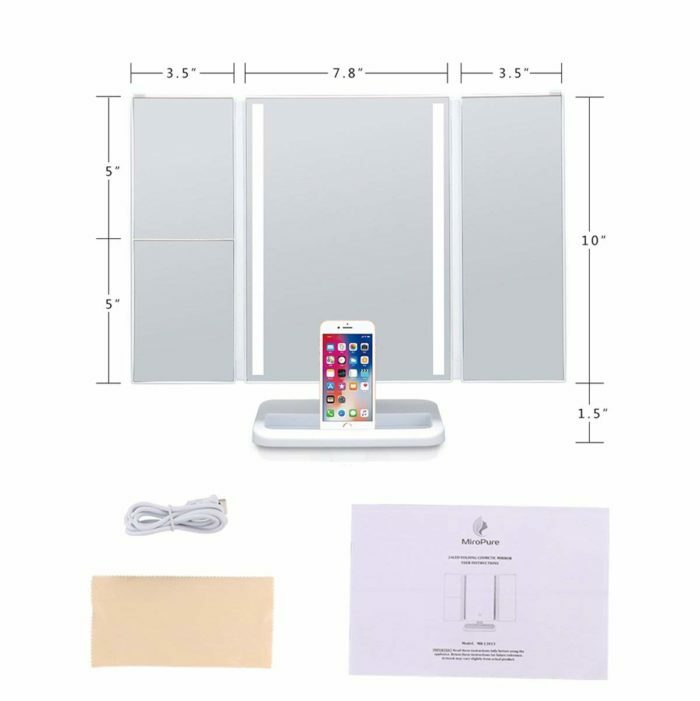 Great mirror, really functional, beautiful design and great size. Highly recommend! Great mirror and easy purchase! Love this mirror!!! The lighting is nice. It’s light and sturdy. I would recommend it. 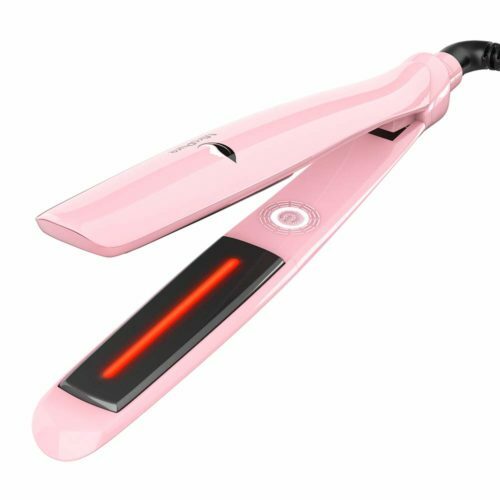 Since it is also battery operated, you could easily travel with it. I love this mirror. The size is just right and so is the lighting. It’s everything I wanted. Gift for granddaughter. She loves it. Bought this gift for someone who likes messing with makeup. The light can be made brighter and has a space at the bottom of the mirror to hold a couple of brushes or eye pencils. You can also put batteries in it to make it mobile. Just great! Just a lovely mirror! Love that it was packaged so well (thick bubble wrap “sleeve”) for protection. So perfect that you can adjust the brightness of the light. Lovely white light, and perfect that it’s side lighting. Love the fact that there are several sections for normal, 2x and 3x magnification. USB usage is so cool, too. 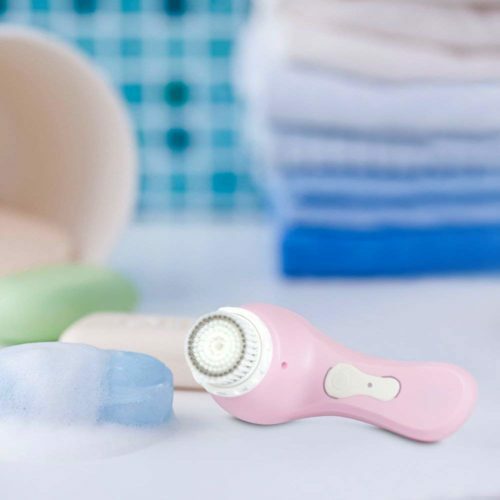 I will get a ton of use out of this product.